Tue., June 5, 2018, 12:27 p.m.
WASHINGTON – An American-backed Syrian Kurdish militia said Tuesday it will leave the strategic town of Manbij under a delicate U.S.-Turkey deal that could ease tensions between the NATO allies and force a realignment of troops along the volatile Syria-Turkey frontier. Illustrating the fragility of the arrangement, the United States and Turkey offered differing descriptions of what the deal entailed, how it would be carried out and when. But ultimately, the Kurdish militia known as the YPG is expected to retreat to east of the Euphrates River, meeting a long-standing demand by Ankara, which considers the militia a terror group tied to a Kurdish insurgency within Turkey’s borders. Ethnic Kurds live on both sides of the border, in southeastern Turkey and northern Syria. Turkish officials suggested an ambitious plan had been hashed out under which the withdrawal would be complete within six months, with Kurdish fighters giving up their weapons as they leave Manbij. A Turkish official said Turkey would review the withdrawal before a new council is set up to administer the multiethnic town, which has been run by the Manbij Military Council for several years. The U.S. wouldn’t discuss whether the Kurdish troops would have to give up weapons, and insisted the plan included only “estimated timelines” based on events on the ground and no hard deadlines. First, joint U.S-Turkish patrols will be dispatched along a pre-existing demarcation line around Manbij, senior State Department officials said, in a sort of trust-building exercise to pave the way for a withdrawal. After the YPG removes its forces, the Manbij Military Council will be reconstituted, with the Kurdish elements removed and the remaining membership made up of “locals” who are “mutually agreeable” to the U.S. and Turkey, the officials said. The officials from both countries spoke on condition of anonymity because they weren’t authorized to discuss the deal publicly. 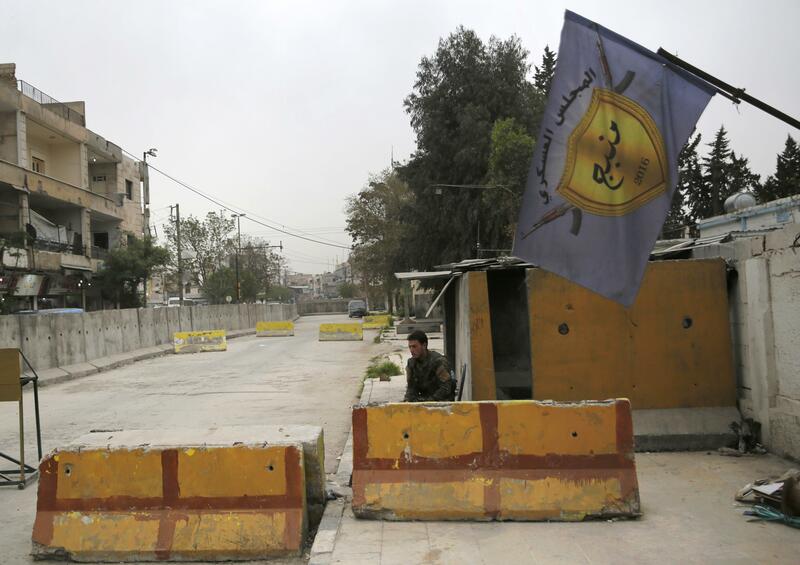 The YPG – Kurdish initials for “People’s Protection Units” – acknowledged that it planned to pull its military advisers out of Manbij, describing it in a statement as the consequence of having completed their mission to train the Manbij Military Council to defend the town. Shervan Darwish, a current member of the council, said residents were “anxious” about the news. He estimated that 1 million people live in Manbij and the surrounding countryside, many of them displaced from fighting elsewhere in the country. What seems certain is that Manbij will remain beyond the reach of Syrian President Bashar Assad’s government in Damascus, which has been forced to surrender much of its authority in northern Syria to Turkey and the U.S.-backed Syrian Kurdish militia as it fights rebels elsewhere in the country. For the U.S., the deal allows the military focus in Syria to return more fully to defeating the last remnants of the Islamic State group, a top priority for President Donald Trump as he seeks a rapid withdrawal of U.S. troops. Turkish military operations against Kurdish-held areas in Syria had become a distraction, forcing U.S.-backed Kurdish fighters who have been the most effective force against the IS group to retrench as they defended against the Turks and allied opposition groups. For Turkey, it could allow more control over part of its border with Syria west of the Euphrates River. It averts a potential confrontation with U.S. forces if President Recep Tayyip Erdogan had followed through with his threat to expand its operations in Syria to Manbij, where the U.S. has stationed troops as a deterrent. The deal also allows Erdogan’s government to claim success on a key national security issue ahead of high-stakes presidential and parliamentary elections in Turkey. So even though the details remained vague and elusive, both the U.S. and Turkey sought to cast the agreement as a win. The U.S. and Turkey have been at odds over the future of north Syria since the U.S. began supporting the YPG to fight back against the rapidly expanding Islamic State group in 2014. In 2016, the militia helped capture Manbij, to the dismay of Turkey, which has been pushing the U.S. to expel them ever since. In the tense front around Manbij, the Kurdish forces have exchanged gunfire with Turkish and Turkish-backed Syrian forces. Despite the near defeat of the IS group, the U.S. has kept 2,000 forces stationed in north Syria, and it operates airstrips and outposts in the Kurdish-administered territory that stretches across Syria’s north and east of the Euphrates River. Manbij lies west of the river. American support for Kurdish fighters in Syria has become a major sore point in relations between the U.S. and Turkey. The two have also been at odds of late over detained Americans, Turkey’s response to a 2016 coup attempt in Turkey and plans for Turkey to buy Russian-made S-400 surface-to-air missile defense systems in violation of new U.S. sanctions targeting Moscow. Wess Mitchell, the top U.S. diplomat for Europe, said Tuesday that the Trump administration was trying to “stabilize the relationship” with concrete, near-term steps, in hopes of avoiding a wider breach that he warned could “do multigenerational damage” to ties between the allies. Still, he put Ankara on notice that its partnership with the U.S. on the F-35 fighter jet program could be imperiled if it goes through with the Russian purchase. Published: June 5, 2018, 12:27 p.m. Tags: Kurds, Manbij, Syria, turkey, U.S.